The founder of the Baha'i religious movement proclaimed his vision on April 21st, 1863. The great political philosopher was born on April 5th, 1588. David Livingstone: Humanitarian or Hypocrite? Michelle Liebst looks at how the career of the great explorer of Africa reflects the wider failings of Victorian imperialism. President Obama has more in common with Dwight D. Eisenhower than any other of his predecessors, says Michael Burleigh. Yvonne Sherratt explores the ways in which Adolf Hitler attempted to appropriate the ideas of some of Germany’s greatest thinkers during his brief incarceration in 1924. Roger Hudson explains a moment of panic on the streets of the newly liberated French capital. Carol Dyhouse questions some of the assertions made by John Gardiner in his 1999 article about the Victorians. The relationship between an ‘unquiet past’ and the concerns of the present has been a key feature of recent engagements with the Spanish Civil War. John Gillingham challenges an idea, recently presented in History Today, that the Anglo-Saxon King Egbert was responsible for the naming of England. In 1943 a train was stopped by resisters as it travelled from Flanders to Auschwitz. Althea Williams tells the story of a survivor. 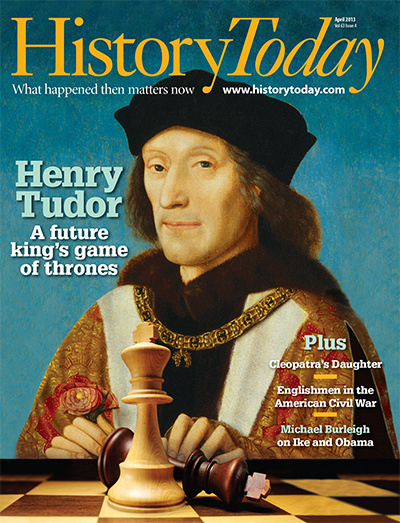 Derek Wilson looks at Henry Tudor’s long period of exile and asks what influence it had on his exercise of power following his seizure of the English throne in 1485. This essay was the winner of the 2012 Julia Wood essay prize. The founding of the great city by the Dutch, and other New York firsts.